We figured that visiting Hiroshima would be really sad, but we stopped over anyway since we had to change trains in Hiroshima on our way to Miyajima. The Peace Museum describing the two atomic bombs at Hiroshima and Nagasaki was sad - but not as horrific as either of us had imagined. We think that the modern media has desensitized us. The only part of Hiroshima dedicated to its atomic history is the Peace Memoria Park where there is a museum, many memorials and the one destroyed building. On the way from the Shinkansen train station to our accomodation, the tram we were riding on let off and picked up people at a stopped called "Atomic Dome". So, the fact Hiroshima's business district was destroyed with a nuclear weapon more than 50 years ago is part of the city. However, we felt that its history was not an overwhelming, opressive prescence in the city (as we thought it might be). Seth thought the peace museum was well done. But, he felt they went a bit over the top in trying really, really, really hard not to place blame - and thus didn't fully describe from a wartime perspective what factors lead to the dropping of the bomb. The museums focus was instead on saying that a nuclear bomb should never, ever happen again. The saddest part of the Peace Memorial Museum for Tara were the photos of ketoids (large lumps of scar-tissue skin) that people developed a year or two after their burns from the atomic bomb healed. Tara kept looking at the place on her forearm that she burned while cooking chicken in November 1999 and thinking of how it would look with a large lump growing there instead of the barely noticeable scar tissue. However, thoughout the whole museum, at no point did Tara start crying and she was really surprised by this. Tara also was surprised at how there was no knowledge of how harmful nuclear radiation was. For example, during the days immediately after the atomic bomb was dropped in Hiroshima, people went about rebuilding the city right in the area where there was the greatest radiation: ie. getting the trains and the trams running though the city center where the bomb was dropped. Today, we know that this had to have been horrible for their health - but no one knew then. In one photo showing a nuclear test site in America, Tara likened people watching a text explosion in Nevada to people watching the Space Shuttle take-off in Florida. The photo showed a festive atmosphere of people sitting in folding chairs in front of a nuclear testing site. There were men, women, and children (with only protective eyegear) sitting practically right under the mushroom cloud created by a test explosion. Tara walked through the museum much quicker than Seth did. When she was done, she went outside to sit in the park since it was a beautiful, sunny day. Tara thought it was great when a young Japanese woman rode her bike up to her, told her that she was studying English and asked if she could practice a bit. Tara, of course, from studying Japanese and German herself, understands how fun it is to practice a foreign language, so she enjoyed a very basic English conversation with the woman. In a while, the woman said she had to go back to work now and rode her bike off through the park towards the building destroyed by the atomic bomb. The conversation consisted of thing like: Japanese woman "Oh, yes. I want to go to America one day." and no refernces at all to anything like "Oh, so you're hear seeing what your country did to my parents." This is a bit different from various comments we heard from Britians alluding to America becoming a country in 1776 while living in London like "King George, your last king" or "You forgot how to speak English after Britian let you go". I thought of the very few number of year that has passed since the Americans dropped a nuclear bomb on Hiroshima vs. the centuries that have passed since America won a war of independence against the British. In Britian, people still remind you that your country was once a British colony. 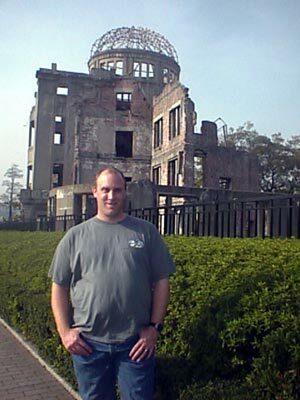 Whereas in Hiroshima, not once did anyone remind me that my country once dropped a nuclear bomb on their city. 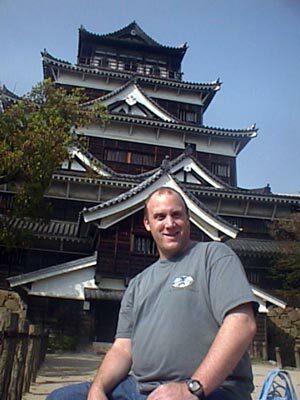 When Seth finished with the Peace Museum, we went for a tonkatsu (pork cutlet) lunch and then started walking towards the castle. It was a nice walk on a gorgeious day through parks and along a river. In the nice surroundings, we discussed how the museum had made us feel. 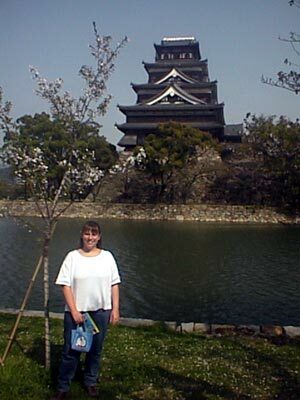 We enjoyed our visit to the castle and were glad that the cherry trees were still partially in bloom. Every once in a while, we'd pass by a plague commemorating something like a particular tree that had survived the nuclear bomb and be amazed. Accommodation 5 Bare-bones Japanese style. Ikeban mishukan was OK, but nothing special at all. It was extremely bare-bones and not nearly as cute at all the other Japanese-style rooms we've stayed in. Coolness 9 Very historical. Nuclear testing will now make a more concrete impression on us.